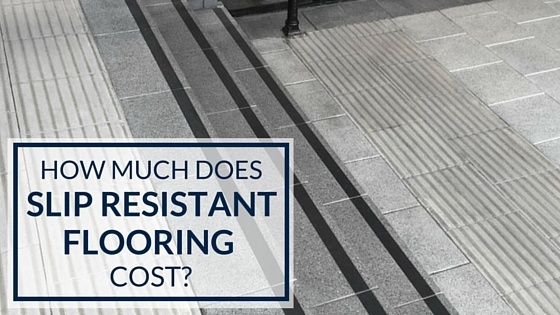 How Much Does Slip Resistant Flooring Cost? When looking for a solution for a slip resistant flooring on steps, there are quite a few options that you can choose. Customers often ask me what the differences are between the options when it comes to price. In this article, I will provide an idea of what type of budget you might need to prepare when looking for a simple slip resistant flooring for steps. The areas where a tape can be used is virtually limitless. Specific examples I have seen include handicap ramps, open walkways with exposure to weather, marine decking, and more. The least expensive option is a slip resistant tape. Although it sounds like a no-brainer, there’s actually some prep work that has to be done before just putting the tape down on the floor. You would need to use a primer on the floor surface to prepare it for the tape and possibly sand off any rough areas. The cost of the tape itself will vary widely, due to the many different widths and lengths of slip resistant tapes as well as the varying levels of quality. The price can range from as little as $10.00 a roll to as much as $900.00 per roll for aheavy-duty, construction quality roll tape that is 2 feet wide. Keep in mind, this type of tape is best suited for an area that doesn’t get a lot of traffic because the less expensive tape would not last nearly as long as a higher quality product. Slip resistant tape is not the right solution for every situation. A good qualify rubber composite slip resistant flooring can also serve as an adequate alternative. A slip resistant flooring can be used in strips or discs on a step, ramp or walkway. You wouldn’t want to use a disc application on the edge of a step, because this wouldn’t give you a solid line of anti-slip protection, which is needed for a stair case. The widths and sizes of the strips and discs are as varied as the sizes for the slip resistant tape. You can find strips that are less than an inch, all the way up to a strip that will cover the entire step. Of course, the cost for these strips will depend on the size and quality of the product you choose. The cost of a good slip resistant flooring starts at about $3.00 per linear foot for a strip under 1 inch. A slip resistant strip that covers the entire step, on the other hand, can run you upwards of $50.00 per linear foot. The installation methods for installing slip resistant flooring in concrete, wood, stone, and other surfaces requires routing out the step or walkway in order to put the slip resistant flooring into the floor. Not that with these surfaces, the flooring would not lay on top of the floor. In these cases, the amount of labor required for installing a slip resistant flooring is substantially higher than that of installing a slip resistant tape. Slip resistant flooring is a great way to help reduce slips and falls on steps, ramps, walkways, marine decks, and other surfaces. The cost can range between $10.00 and over $900.00 a roll for slip resistant tape. The range for slip resistant flooring ranges from just a few dollars per foot or per disc to around $50.00 per linear foot. Your situation and environment will dictate what is best for you. We distribute the Gradus line of flooring accessories throughout North America. The Gradus line offers very high-quality slip resistant tapes and a range of super heavy-duty slip resistant flooring products. If you’d like more information, please feel free to download our Gradus catalog below.